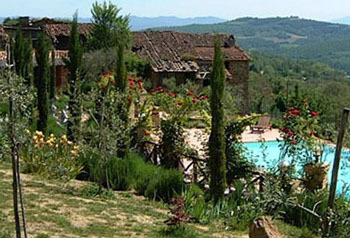 So, your Umbrian/Tuscan dream home has just been restored. 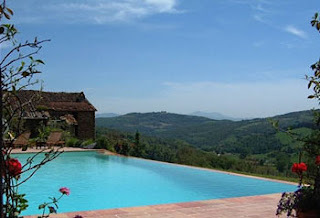 The roof is sound and insulated, the windows are double glazed and shuttered, the wooden beams and terracotta floor tiles sand blasted, the bathrooms are gleaming examples of porcelain and chrome and the kitchen is fully fitted and kitted. Your dream home all ready to enjoy. Then you go outside and .............the dream fades.......quickly! Mud, building materials, more mud, oil drums, wooden planks, equipment waiting to be taken away, equipment that will never be taken away, piles of rubble, piles of mud, piles of unidentified "stuff", filled in channels that look like a giant mole has been rooting around, areas of ground that have mysteriously subsided, the builder's hut, more mud, and if you are really, really unlucky....a porta loo! You dash back inside to stroke the glossy surfaces of your new kitchen and gain some comfort by clutching at some handy Italian made soft furnishings. This is the normal course of events; you restore the house and then, when funds and more importantly enthusiasm, are at an all time low you have to contend with the garden and maybe even the construction of a pool! Gardeners are one thing but those builders, can you really bear to see them again? Indeed can they bear to see you again? A property can be restored relatively quickly but a garden will take years and years to mature; it's going to be ages before you can walk from car to house without squelching. Oh, for the crunch of rubber on gravel, the scent of lavender, the sight of a wisteria covered pergola and the sound of happy children/grand children/family/friends/family pets splashing in the pool! The garden is mature and packed with well established plants, the pool ready for splashing/swimming/paddling, the barbeque primed and ready, the pergola shady and that underground pool room.......well it is many a man's dream. There are pipes to polish, levers to twist, gauges to tap, cisterns to fill, switches to flick and no female in her right mind would even want to set her Bruno Magli shod foot in there! Mind you, the house is still a romantic ruin festooned with brambles BUT it is alongside the garden and not in the middle of it so any future builder intereference would be minimal. In fact, the house could be left as it is for a while; a tent, caravan, wooden cabin would do just as well in the summer and, as there is a bathroom on site, there would be no need to invest in a porta loo. Yet. Buying a ruin with a swimming pool and mature garden is a concept that is difficult to grasp but, on reflection, it is actually an extremely logical choice. Can't think why it hasn't been done before!